At the end of Hajj (annual pilgrimage to Mecca) Muslims all over the world celebrate Eid al Adha. Also known as "festival of sacrifice" or "Greater Eid" is an important religious holiday celebrated by Muslims to commemorate the willingness of Ibrahim to sacrifice his son Ismail as an act of obedience to God. When Ibrahim was all ready to sacrifice his son, God revealed to him that his sacrifice has been accepted and that he has proved his love for God over his own life or his loved ones. In remembrance of Ibrahim's trail, Muslim's slaughter an animal such as sheep, camel or goat. In a traditional setting, each family sacrifices an animal in the name of God. The meat of the slaughtered animal is then distributed among poor, friends, extended family and some portion is retained for the family. This basically means a lot of meat at your disposal. Not only because you sacrifice an animal but with an abnormally large extended family and friends my dad has, every minute we were at the door receiving meat packages. For the 3-4 days following Eid, at least one meal would consist of meat, often times two. The whole week seemed to be gluttony override. First day would be a simple Indian mutton stew gorged down with jeera (cumin) rice. The next day the whole family would plan a picnic, where meat used to be barbecued featuring scrumptious fresh tikkas and kebabs. Later days followed by mutton rogan josh to roasted shanks. 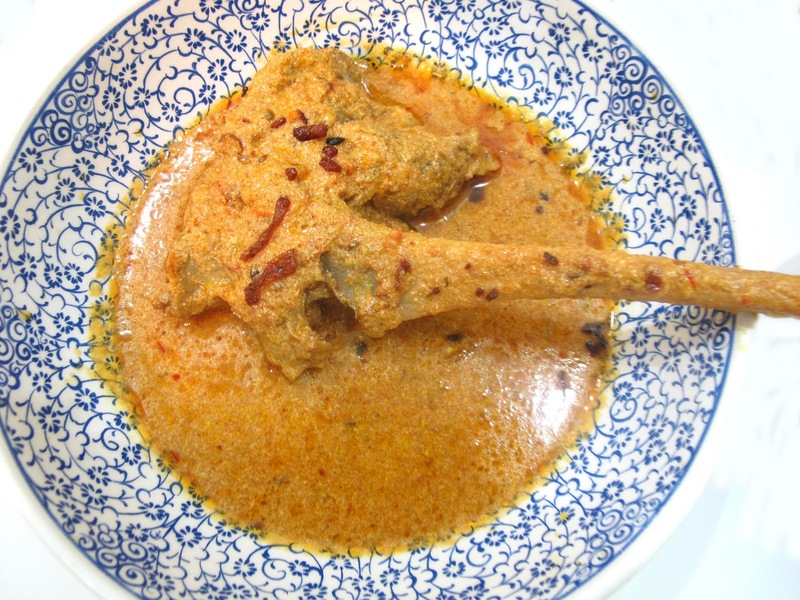 And one of the days mom would make mutton korma. Though she never called it that. For her it was just another take on "tarkari" which is a generic word for stews in our local dialect. Often times when I have to reproduce my mom's recipe on the blog, I can't seem to find a name for them. My mom is not a cookbook, cook shows or a recipe collector. She is just a fabulous cook. When she churned out beautiful recipes such as this, she never bothered with the names. When she would ask us what you want for lunch we would say " Tarkari dahi biriste wali " (Stew with yogurt and fried onions). Me: Mom, you know this recipe of yours with fried onions and yogurt, what do you call it? Me: Mom, I know but what do you call it, I need to name the recipe. Is it a korma? Mom: hmmm...korma...what’s that...that a Mughlai name is it? Me: yes Mom mutton korma is similar to the recipe but korma has nuts but this doesn't have nuts. Me: Mom, this is a blog, you have to write responsibly. There are people ready to kill me for calling a recipe by wrong name. Me: Thank you mom you are SO HELPFUL! Mom: It has saffron ...so...hmm.. 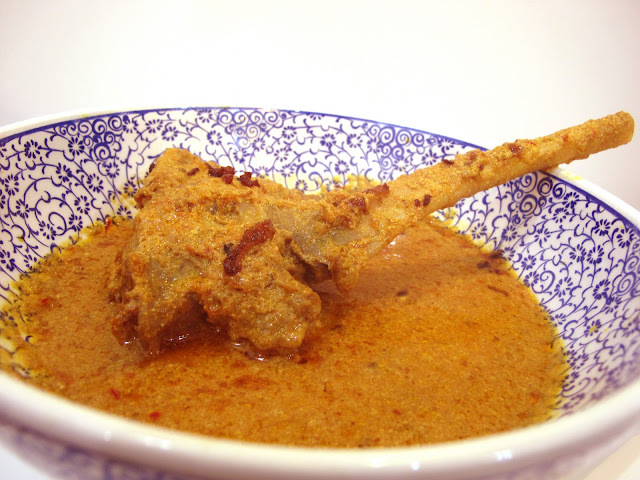 So, I called it mutton korma. If you got a problem with that, contact my mom at your risk. You might as well end up with hmmm... . I warned you. Marinate the shank overnight if possible or an hour minimum. Blend the tomatoes to juice. Take olive oil in a pressure cooker if using, or a deep saucerpan. Add the bay leaf, cardamom, cloves and cumin. Once the spices crackle, add the garlic. When it loses rawness, add turmeric, red chilly and coriander powder. Add the tomato juice and mix well. Add the shank and let it cook in the tomato sauce for about 15 minutes. Add enough water to drown the shank and pressure cook it for 15-20 minutes, if you not using a pressure cooker it may take about 45 min-1 hour. Let the pressure cooker cool down and be engulfed in the aroma of meat and all the spices. If you think that you added too much water, you can let it cook without covering for some more time to reduce it. In the yogurt, blend the fried onions and keep aside. Also, add in the saffron. Garnish it with nuts if you prefer, but I don't. Serve with fragrant zeera (cumin) rice or pita bread or naan. Here's wishing you a very happy Eid. Eid Mubarak! It is so true what you said about recipe names..atleast and my mum gives me the most boring names..for her EVERY mutton preparation will be mutton curry! Its so different out here..ppl recognize preparations by specific names.. The other day hubs took mushroom matar dry curry to his office,his colleague asked him what's it called..he said mushroom peas and the colleague was slightly irritated & made a face and said she knows that ! Reply to your comment on my blog..check out! thanks for putting mutton on my mind. also, i am glad to learn a bit about the muslim faith. the internet has narrowed boundaries for non-muslims to learn more about the faith through food and people. Eid Mubarak! 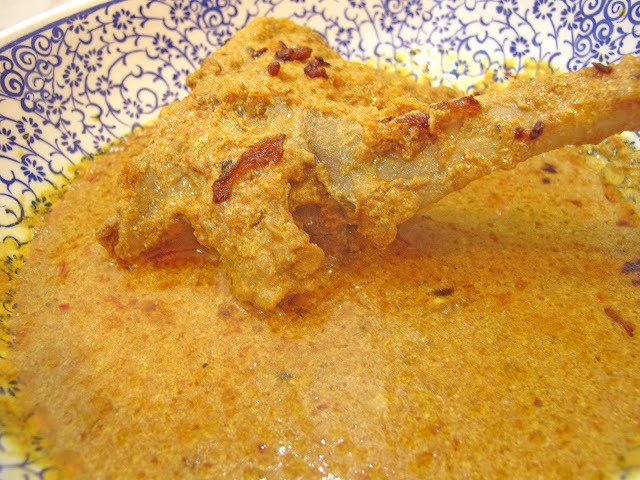 Lovely Korma, must be very tender and flavorful! Eid Mubarak to you ; this korma looks full of flavor, just the kind if dish I would love on such an occasion. Funny dialogue with mum. Beautifully said the meaning of Eid Al Adha and the khorma is just delicious! Yum! I am with you there is nothing to beat the "Culinary Institute of Mom & Grandma"
assalamu 'alaikum - since I blog alot of my mother's recipes I can empathise with that conversation :-) although since the blogging my mother is more likely to give things a name I never heard her use before. I suspect she engages in internet research ;-) when pressed for a name and details. Ottimo sito di Ricette e di piatti davvero originali: ti invito anche a visitare il nostro blog dedidato alla cucina Italiana. in sha Allah i'll try it...looks yum yum yummy! I just love the way you write. Its so friendly and so well executed.Be it pictures and the way you have designed it. Kudos to you!! Tandoori Chicken and First Blog Anniversary!